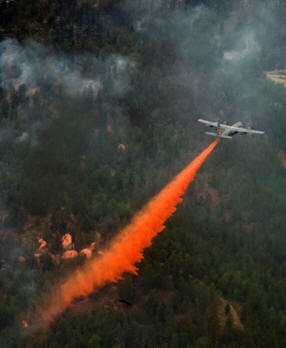 September 18, 2012 - The U.S. Forest Service has deactivated the Modular Airborne Fire Fighting System-equipped military C-130 Hercules as fire conditions in the West have improved. The 153rd Air Expeditionary Group received the notification late Sept. 14, releasing the two MAFFS planes and crews that were still operating, as well as the associated support and maintenance staff. All crews have reported back to their home stations. The California Air National Guard's 146th Airlift Wing, and the North Carolina Air National Guard's 145th Airlift Wing each had a C-130 operating out of McClellan Air Tanker Base, Calif., for the last few weeks. On Sept. 2, two C-130s from the Wyoming Air National Guard's 153rd Airlift Wing were released from MAFFS operations in Boise, Idaho. Two C-130s from the Air Force Reserve Command's 302nd Airlift Wing were released from duty Sept. 7. "Although our planes and crews have returned home, we all know MAFFS can still be reactivated well into the fall," said Air Force Lt. Col. Donald Taylor, 153rd Air Expeditionary Group acting commander. "We have had a very busy season and know it's still too early to say the season is over for good." According to 153rd Air Expeditionary Group officials based in Boise, Idaho, this season has become the second-highest in MAFFS history for gallons of fire retardant dropped, surpassed only by the MAFFS season of 1994 when about 5 million gallons were dropped. This season, through Sept. 14, the MAFFS fleet released almost 2.5 million gallons of fire retardant during 1,011 drops on fires in 10 states. MAFFS is a joint Defense Department and U.S. Forest Service program designed to provide additional aerial firefighting resources when commercial and private air tankers are no longer able to meet the Forest Service's needs. This is the first year since 2008 that all four MAFFS wings had been activated simultaneously, officials said. As a self-contained aerial firefighting system owned by the U.S. Forest Service, MAFFS can discharge 3,000 gallons of water or fire retardant in less than five seconds, covering an area a quarter of a mile long by 100 feet wide. Once the load is discharged, it can be refilled in less than 12 minutes.